The San Diego State football team celebrates after it’s win over University of San Diego in 2015. Courtesy of GoAztecs Facebook. San Diego State Football secured its biggest blowout of the season Friday, defeating the San Jose State Spartans 42-3. The Aztecs scored 21 points before the Spartans got their first field goal. They wouldn’t allow any momentum to sway over to San Jose State, scoring another unanswered 21 points. All of those would come in the third quarter. Despite opening up the game with a David Wells pass touchdown, the rest of the game would be as usuRunning backs Rashad Penny and Donnel Pumphrey each had a game to remember, scoring three and two touchdowns, respectively. Pumphrey also passed Aztec legend Marshall Faulk on SDSU’s all-time touchdown list. 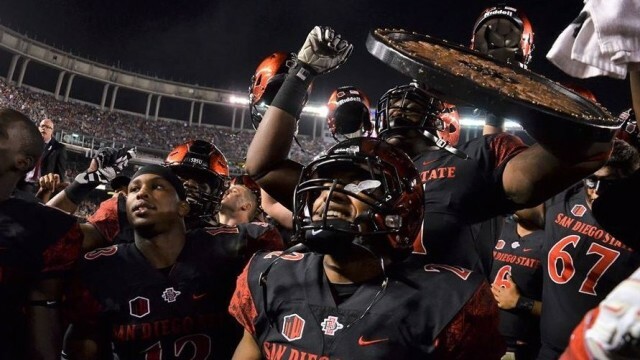 The Aztecs take on Utah State next Friday in their quest for an undefeated conference slate.